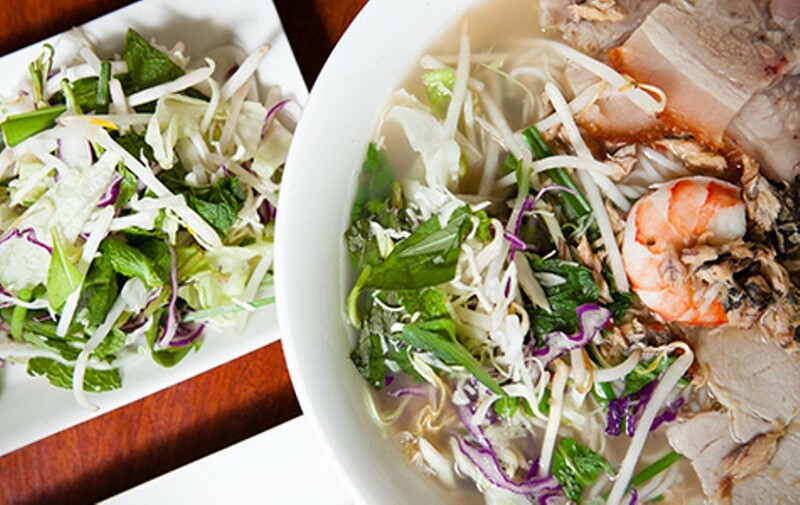 Although the Vietnamese soup spot serves the staple, its menu far exceeds typical steamy offerings. Bert Johnson The House Special Noodle Soup is a sharp-smelling fish soup that is a signature of the Trà Vinh region. Bert Johnson An employee at Mien Tay ladles out a bowl of soup. 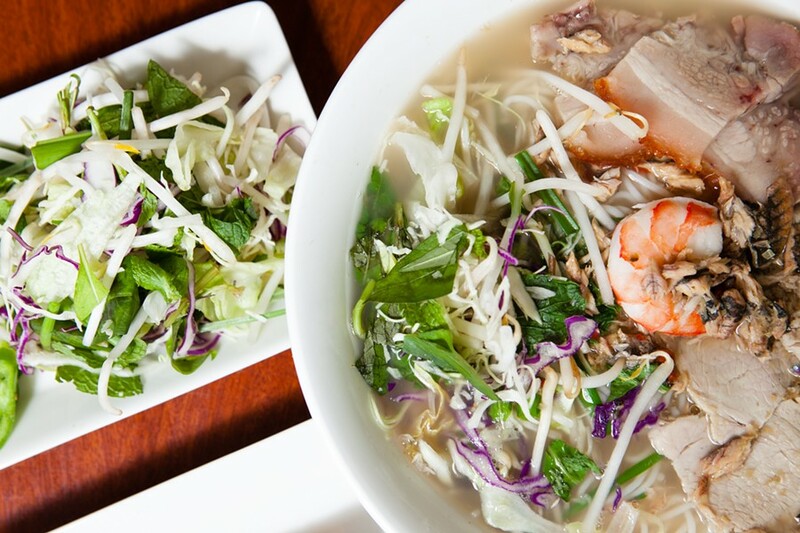 A clean, small diner-like soup spot, Mien Tay passionately focuses on southern Vietnamese cuisine and its brazen palette of tang, chili, and seafood flavors that rarely get pride of place in Bay Area restaurants — even in Vietnamese ones. Growing up in the Bay Area, I had narrowly characterized Vietnamese cuisine by the beef, star anise, and fresh herbs used in pho and banh mi, and I never made a strong connection between the flavors of Vietnamese and Filipino food until I came to Mien Tay. I think it's an understandable mistake, considering the proliferation of banh mi, pho, the usual rice and vermicelli plates, and not much else. Part of the reason why Calvin Do and his sister Linda opened Mien Tay was that they couldn't find the soulful food unique to their birthplace anywhere in the Bay Area. Specifically, they couldn't find the fish soup that's the signature of their hometown of Trà Vinh in the Mekong Delta. On the Mien Tay menu, it's just referred to as House Special Noodle Soup: a whole Goby fish simmered with fish mint (a pungent type of mint associated with Vietnamese cooking) to make a sharp-smelling, saliva-inducing, savory broth — so savory, a person on high-alert for MSG might raise an eyebrow. (The kitchen doesn't use MSG, by the way.) Blue-silver-skinned morsels of fish were entangled with rice vermicelli, along with fried shallot. Lean, extra-thin slices of pork floated above. A shrimp tail curled at the center of the bowl, which was generously laced with lime and minced red chilies. It was almost as sour as the outside of a Sour Patch Kid, and its heat was sharp enough to pin a few posters to the wall. Altogether, my bowl of soup was an agile assault of heat and salt, tempered by cooling slivers of cucumber, refreshing lime, and sweet sea smell. To top the whole thing off, just as I was sinking into its complex steam, the server delivered a cha giò — a fried egg roll of pork, shrimp, and carrot — to dip into the bowl and eat with the broth and noodles. As if more adornment were necessary. Not that it was overkill — the kitchen managed to balance the flavors with aplomb. More intensely fishy was the bún riêu cua — the crab and tomato soup. Made with crab paste and picked crab, its steam possessed the kind of perfume that separates the bolder fish flavor aficionados from the dilettantes. I did hope to see larger lumps of crab swimming around, but in the end was satisfied with my bowl. Set in this magical elixir: rice vermicelli; a whole, ripe plum tomato, peeled and cooked soft; cubes of fried tofu that acted as sea broth sponges; and two hefty, rough-hewn pork and shrimp meatballs that were the bowl's savory stars. Lovers of fish-funky kicks in the nose, add this soup to your list as one to try. This isn't to say that the spot only serves strongly flavored soups that require a taste for sea funk and sour. One of the soups I liked best was the subtle, clear Vietnamese udon (bánh canh giò heo). The simple broth, flavored with roasted ginger, roasted onions, and daikon, served as a background for translucent, pencil-thick rice noodles and a variety of pork cuts — thinly sliced, ultra-lean pork, and knobbly, gnarled pork knuckles. The pork skin had been stewed to a tasty tenderness and texture that harmonized with the chewy noodles. Though Vietnamese soups are meant to be eaten piping hot, I found that the full-bodied broth grew richer and silkier on the tongue as it cooled. Another mild soup was the curry chicken (càri gà), which was sweet with coconut milk and soft white hunks of yam, and came with a choice of fresh bread, noodles, or rice. Without a trace of heat, the soup could soothe a child. A small dish of salt and pepper with a squeeze of fresh lime was provided for optional bite. I found it interesting to dip my meat into it, punctuating the sweetness with a little sass. Kevin's, a longtime pho institution, is just across the street from Mien Tay. Since it's been closed for renovations until further notice, Mien Tay has picked up the slack, serving more typical (and quite delicious) rice plates and a good, non-greasy bowl of pho, made with dense, peppery beef meatballs, shoulder so soft you can pull morsels of it easily with your chopsticks, and rare sliced steak. It's not a standout like Mien Tay's other bowls of soup, but it's better than satisfactory. The more I eat at Mien Tay, the more it reminds me of the flavors of my Fil-Am home life growing up. It was the equivalent of Proust's madeleines — one taste of Mien Tay's House Special Soup, and complex, personal feelings about my childhood arose. The cha giò bore more than a striking resemblance to my mother's lumpiang shanghai. The House Special Noodle Soup is a kissing cousin to my mom's tangy sinigang. Even a simple grilled pork chop — served blade thin, tender enough to cut apart with a spoon and fork, and beautifully seasoned so that its sugary marinade produces a fragile char on its edges — reminded me of tocino, a Filipino breakfast meat. It was refreshing to find a familiar palette of flavors there, used differently, and so well. There's no carelessness about Mien Tay. Linda Do is always in the open kitchen, where she can be seen pounding steak for pho or dressing a bowl of soup. The food tastes fresh, the meats are of good quality, the tomatoes are always ripe; and each dish is thought out individually. The ingredients for the soups aren't interchangeable — in fact, many of the broths taste strikingly different — and they never taste hollow, papery, greasy, or watered down. Even the passion fruit juice is made with real passion fruit, with edible seeds swimming about in the liquid, below the ice. In so many little ways, the restaurant's desire to serve food true to its region shines through. My complaints are minimal. One is that the coffee, rich and sweet as melted ice cream, is served in a paper cup, instead of a glass or mug. The other is that the accompanying plate of fresh garnishes for the soups, though adequate, may be a tad slight for some. Those accustomed to the abundance of greenery at Pho Ao Sen may take notice, though May Tien is wonderfully accommodating, and I wouldn't feel uncomfortable asking for more. Service is casual and friendly, and I can ask questions about the customary ways of eating things without being made to feel weird about it. With the restaurant's ten or so tables looking clean and washed in light from the wall of windows along one side of the shop, it's easy to linger and sink into a long conversation with a friend while the two flat screen televisions on either end of the restaurant burble with soap operas, California Music Channel, or the news. Mien Tay struck a personal chord with me because the flavors reminded me so overwhelmingly of home. But what really encourages me to go back is the restaurant's obvious care for its food, its friendliness, and its opening hour. Finally, a place to get Vietnamese coffee and a hot, bracing, sinus-clearing bowl of soup wider than my head, at eight in the morning.